Summary of the project: I spent a month at a Brazilian children's hospital helping to raise awareness of their bazaar and increase donations. 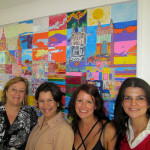 Helen came to Brazil on October 2010 to work with IMIP and she was the first person BBH sent on a TIE placement. Helen joined BBH in 2007 to work on Vodafone UK. She spent her first 18 months at BBH on the fast and furious account working on the brand’s repositioning as well as leading numerous integrated product campaigns across the UK business. In 2008 she joined the Barnardo’s team and was instrumental in developing and delivering the Break the Cycle campaign. The success of the charity’s advertising continued with the award-winning Turn Around campaign which depicted the decline of a young girl’s life into drug abuse and sexual exploitation and showed how Barnardo’s helped her to turn her life around. In 2009, Helen set up the eBay account after the new business win for BBH and developed and delivered eBay’s first above the line communications in Europe for two years. The campaign communicated eBay’s move into the classified market in France under the positioning of personalised choice. The campaign sought to change the perception of eBay as purely an auction site. The TV advertising was loved by consumers and started to give eBay a voice. As a founding member of Sprint, BBH’s innovation department, Helen now leads the ITV account. She has been working on ITV since the beginning of the year and has just delivered their new brand campaign for HD – a visual feast featuring their top talent and shot by Tim Bret Day. Before BBH, Helen was at The Red Brick Road where she worked on Tesco and was instrumental in the launch of Tesco Compare – Tesco Personal Finance’s response to aggregator sites in the insurance market. Previously, Helen lived in Sydney for a few years, working at BMF and JWT. Although the lifestyle was amazing, the lure of packed tubes and endless winters got too much and she hurried back to London. In her spare time, Helen loves to travel, exploring new lands and cultures. She recently spent a month in India travelling around Rajasthan and Kerala and can’t wait to see a little of the real Brazil. She is also a big fan of music and cinema and can usually be found in the Ritzy or Academy in Brixton. To learn more about the project that Helen worked on, click here.